The third weekend of the year is positively flooded with new content, including three new films and the first chance for most of the country to see one of the top Oscar contenders of the year. It's a possible rare feat that might be the real story of this weekend, though. After headlining the top film of last weekend with the expansion of Zero Dark Thirty, Jessica Chastain is set to double that achievement, albeit not with the same film. Although virtually unrecognizable in a brunette wig, she's the main drawing card in the horror film Mama, which is the most likely film to top the charts this weekend. 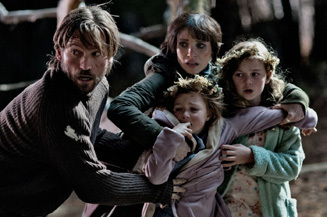 She and Nikolaj Coster-Waldau (Jaime Lannister from Game of Thrones) play a couple who find his long-lost nieces in the woods after a five year search. Somehow they survived all this time, but just how did these young children stay alive – or perhaps more importantly, who was protecting them all this time, and is whoever, or whatever, ready to give them up?